Hot on the heels of winning the Irish Car of the Year award for its new E-Class, the German premium brand might just have another winner in the shape of its new E-Class coupé. We have written numerous times on these pages how Mercedes has turned the screw on its rivals in the premium segment. And having been behind the wheel of the new E-Class coupé in the last couple of weeks, BMW and Audi will need to be very carefully looking over their shoulders once again. On the outside, the new E-Class coupé oozes style. Its sharp lines and muscular stance has helped to put this German brand back on top of the premium pedestal. The coupé proportions are characterised by a distinctive front end with a low-positioned sports grille, including a central star, a long, sweeping bonnet and four frameless side windows. On the inside, the coupé is, like what it says on the tin, a touch of Class. My test car featured red-leather sports seats with all the AMG Line trimmings that help set this apart from its rivals. Again – and it is possibly its only flaw – the company has restricted it to a four-seater car – possibly choosing comfort over practicability. However the coupé, like its saloon sibling, comes with some of the latest technology and safety features that Mercedes are famous for. You will also notice that many of the safety features are trickling down from the flagship S-Class. Standard features include active brake assist. This can warn the driver of an imminent collision, provide optimum support with emergency braking and, if necessary, also autonomously apply the brakes. Elsewhere, my test car was fitted with the two optionally available high-resolution 12.3-inch displays that look to me like a double iPad turned on its side. On the road, the new E-Class coupé is a joy to drive. My test car was fitted with the nine speed automatic gearbox that is as smooth as a baby’s bum on the road. Like most Mercs, it seems most happy when it’s cruising the motorways, but it can certainly hold its own around the city centre roads. 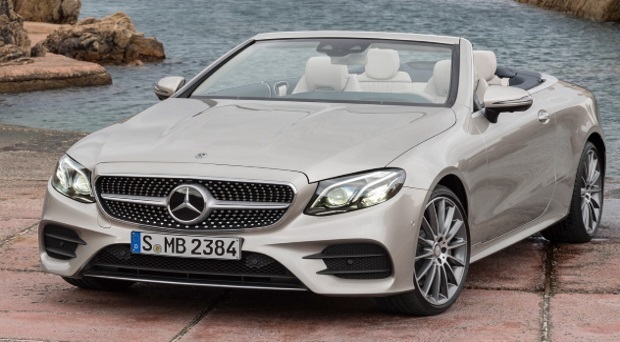 To top things off, Mercedes has this week announced the introduction of the new E-Class Cabriolet – which will arrive on to the Irish market in September. This has seen Mercedes-Benz carry out the complete renewal of their entire E-Class model range, all within the space of only one year. Said by Mercedes-Benz sales manager in Ireland, Ciaran Allen to be an “object of desire” for all who enjoy open-top motoring, the new Cabriolet adds what he terms “that extra element of fun and enjoyment” to a range that is the backbone of Mercedes-Benz sales, in Ireland and worldwide. Models likely to attract most attention here will be a 1991cc, 4-cylinder, 184hp E200 petrol and a 1950cc, 194hp, 4-cylinder E220d diesel, all Euro 6 emissions compliant and all with 9G-TRONIC nine-speed automatic transmission. For the first time, a 4MATIC all-wheel drive version will also be available.